V-Machine: fill it with all your favourite sounds. 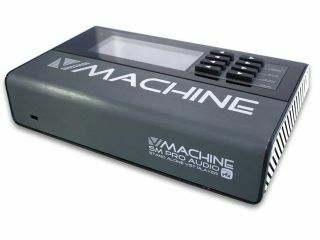 SM Pro Audio has started shipping its V-Machine. This is the first in a range of standalone VST plug-in boxes that was launched at the 2008 Musikmesse. Like Muse's Receptor, the V-Machine can be loaded up with your favourite instruments and effects so that you can use them away from your computer. Plug-ins can be combined, and parameters can be controlled via MIDI. On the downside, the V-Machine's specs aren't exactly mind-blowing: it features a 1GHz processor, 512MB RAM and a 1GB flash hard drive. This means that it could struggle to handle some of the more power-hungry plug-ins on the market, though it is worth noting that sample content can be streamed from an external USB hard drive. Further USB sockets enable you to install plug-ins via your computer and connect up a MIDI keyboard/controller (a standard MIDI In is included, too). There's a pair of unbalanced TS audio outputs, plus a further mini-jack headphones out and a mini-jack audio input. A dedicated software application enables you to manage your V-Machine's content - this is compatible with Windows, Mac OS X and Linux. At $599, the V-Machine is certainly competitively priced, though we'll have to wait and see how it performs before we let you know whether it's a viable solution for keyboard players and DJs who want to take their plug-ins to the stage. No news yet on exactly when the other products in the range - the guitarist-friendly V-Pedal and studio-orientated V-Rack - will be released, but the SM Pro Audio website states that they'll be 'available soon'.